Help promote the Center for Exoplanets and Habitable Worlds with this CEHW Poster. 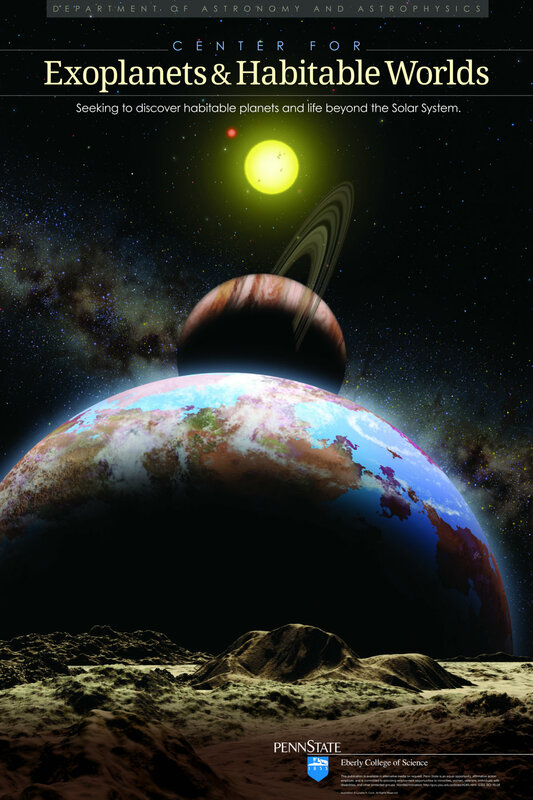 CEHW worked with a well-known exoplanet artist (Lynnette Cook) and a local company (Graphics & Design) to develop this original artwork for promoting the center. CEHW members are encouraged to use the artwork in their talks and/or posters to help raise awareness of the center among our colleagues. While CEHW has obtained permission to use it for a wide variety of purposes (e.g., brochures, banners, presentations, press releases, web use), we are required to include a credit line whenever reasonably possible. When making the artwork publicly available (e.g., webpages), we are to only post low-resolution images. Web appropriate versions of the artwork are available below. Center members may download full resolution images for use in talks, posters, etc. from https://psu.box.com/CEHWGraphics after logging in with their PSU id. Some members may need to request that their PSU user id be added to the list of users with download permissions inside box.com.